MA Beading. Size 10 Short Sharp Beading  - $3.18 : Yarn Tree, Your wholesale source for cross stitch supplies. Item 2474. 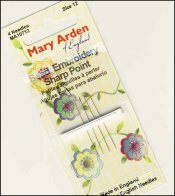 Size 10 Mary Arden Short Sharp Beading Needles. 4 needles per card. Short,very thin needles for doing beading. These will work easily with seed beads. 1¼” long. 6 cards per box. Please order by the number of cards.